British Ska/Pop band, Madness was formed in 1976 in Camden Town, London. Madness achieved immediate and great success with their debut album, One Step Beyond, which reached number two in the British album charts. From 1980 to 1983, the band scored 13 UK Top Ten singles, including My Girl, Baggy Trousers, It Must Be Love and House of Fun. In the U.S. 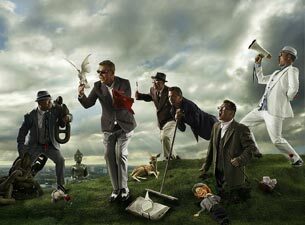 Madness' greatest 80's hit was "Our House" which was easily seen in heavy rotation on MTV. The band continue to perform with their most recognised lineup of seven members, although their lineup has varied slightly over the years. They were one of the most prominent bands of the late-1970s 2 Tone ska revival.